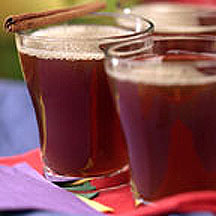 This hot tea punch is especially good to sip on after a play day in the snow. Combine water, sugar, Nestea, cloves and cinnamon sticks in large saucepan. Bring to a boil over high heat, stirring occasionally. Boil for 2 to 4 minutes. Remove whole spices, if desired. Stir in Juicy Juice and lemon juice. Serve hot. Nutritional Information Per Serving (1/8 of recipe): Calories: 110 Calories from Fat: 0 Total Fat: 0 g Saturated Fat: 0 g Cholesterol: 0 mg Sodium: 0 mg Carbohydrates: 28 g Dietary Fiber: 0 g Sugars: 26 g Protein: 0 g.